There are so many good things about shrimp that it would be a shame to not include these tiny crustaceans in your diet. Shrimp are very lean with only 90 calories and 1.5 grams of fat per 3-ounce serving. They're also a good source of vitamin B-12, iron and zinc. And while shrimp have gotten a bad rap for their cholesterol content (a 3-ounce serving has 179 milligrams of cholesterol), researchers have found that moderate consumption does not have a detrimental effect on blood cholesterol levels since shrimp are low in fat and saturated fat. There are so many ways to enjoy shrimp: shrimp gumbo, shrimp scampi, shrimp cocktail, shrimp creole, grilled shrimp, battered and fried shrimp, coconut shrimp, etc. The best part about shrimp is its ease of preparation… as long as you buy it already peeled and deveined! Raw shrimp only take one to three minutes to cook and precooked shrimp only need to be reheated. The big shrimp mistake is overcooking them, causing them to be rubbery. Raw shrimp start off gray and translucent and are cooked when their flesh are opaque with a slight pink color with red tails. You may buy shrimp raw or precooked, frozen or fresh (although those fresh shrimp at the meat counter have already been frozen), and tails on or tails off. They also can come in a variety of sizes, such as medium or jumbo. Raw fresh shrimp should be stored in the refrigerator and eaten within one to two days. Fresh shrimp is best if it's not refrozen, but if it must be, consume it within three to six months. When buying shrimp already frozen, keep it no longer than one year for best quality. Preheat oven to 425?F. Spray baking pan with non-stick spray. Whisk egg in a small bowl. Place flour in a separate small bowl. Combine coconut and panko crumbs in a third small bowl. 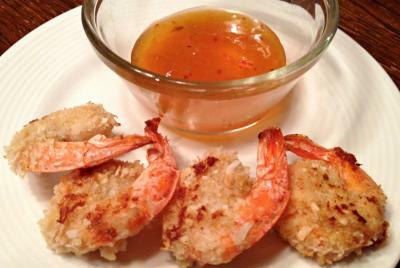 Dip shrimp in flour, shaking off excess, then egg, then coconut mixture. Lay shrimp on baking pan. Spray tops of shrimp with cooking spray. Bake for 10 minutes. Turn shrimp over and bake for another 6-7 minutes until cooked through.